Sundays are peaceful at Pea Pickle Farm. Buster is pooped from his day at the farmers market, a day in which he stays in the van, which has been rigged with a blanket for shade and an old ottoman to barricade a wide open door, all in an effort to prevent him from frying or steaming or otherwise overheating, but he stays on watch, standing most of the day looking out either of the front windows, watching, in his semi-blind way, the world go by, and by the end of the day his back legs are so beleaguered he's got an odd, squattish look to him, all akimbo, and I wonder how it is he doesn't just collapse. (For those who don't know, Buster is a rather old dog, 17 years old, to be exact.) Buster will collapse after the market is over, when we are loaded up and heading out of town. He settles down, chin on my knee, will sleep the 80 miles home. On Sundays, he continues to sleep. On Sundays I am tired from the market, having talked with more people in that five- to six-hour stretch than all the rest of the week, having unloaded the tent, the table, the beeswax candles, the display, and all the paraphernalia from the van and then back to the van, usually, this summer, in a bit of heat and bearing-down sun. But it is a good tired, as there is the satisfaction of having gotten out, having sold a few candles, having had some fun, and of having a little money in the pocket. On Sundays Elliott, the cat, sleeps the day away. It is just like every other day, for him. And on these peaceful Sundays I clean house. I dust, I vacuum, I sweep away cobwebs and fur and dervishes of dust. I clean the bathroom. I might change the sheets on the bed. Maybe I'll do a little laundry. While the dog and cat snooze, I clean and enjoy every minute of it. When I am done, if the weather's agreeable, I go down to the river for a swim. So this, now, is my Sunday habit. There was a time when my Sunday habit involved the Sunday newspaper. The comics first, then other sections, the sections changing over time, but usually the front section, the actual news section, last, and putting the crossword puzzle aside for later. The ritual of separating the ad circulars into two piles, one for looking at, the other for tossing in the recycle bin. The ritual of idling through the colorful, glossy pages, looking at all the possibilities for stuff I increasingly did not need or want. It was a comfortable habit, sitting in my chair, tea on the side table, the paper all around, strewn about, but a few years ago I stopped delivery of the Sunday paper. At first, Sunday mornings seemed odd, but then not. The Sunday paper habit had gone the way of many others: the soap opera habit, the cigarette habit, the beer habit, the root beer habit, the ginger ale habit. Now it's just an occasional root beer float at The Drive-In. There was a period of time when my ability to discard habits that I no longer cared for worried me. What if, I thought, habit is all life is? And if I keep discarding habits, what will I be left with? Who will I be? Oh my - what if all a person is is his or her habits? Without my particular habits, who am I? And how will people know me, if I keep changing my habits? Shouldn't I be more consistent? (My father was a model of consistency, as is my mother.) Do I have a problem with habitual behavior? Believe it detracts from free will and all that? Well, no. I am actually still a mess of habits - like it's about time for dinner so I better either wrap this up or put it away for later because, uh, it's about time for dinner, never mind whether I'm actually hungry or not, but of course I am, because stomachs and appetites, I am sure, adhere strongly to habit. For the most part, I think we are, or at least our lives are, very much the sum of our habits, and that's OK. Just as long as we are each free to choose our own habits and to break them when ready. There are times, of course, when a change of habit is forced upon one. It causes stress. "Life events," I've heard them called. Divorce. Marriage. Death of a loved one. Loss of a job. Moving. I spent about half of last year moving and for six months or more kept a foot in each of two places that were a hundred miles apart. 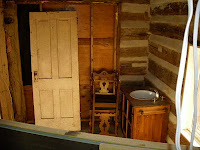 One, the one I was moving to and couldn't wait to move to, did not have running water and, for a while, no electricity. The other I had to sell and pack up and clean out of and even though it had a toilet and hot water, it became increasingly difficult to stay there. I had a grand sense of dislocation - discombobulation, to use a favorite word - and my only routine was packing up to spend the night here then there and back again and wondering when it would all end and how it would work out. That, and the Saturday farmers market. I remember thinking: What I wouldn't give for a little homey humdrum routine. So now, peaceful Sundays. A habit I'd like to keep. For a little while, anyway. 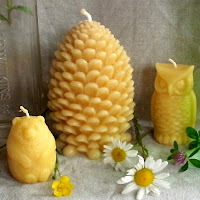 If beeswax can change color, why can't I? Scene from a bee yard. Once again this little candle business that started with a purchase of 500 lbs. of beeswax, though really, before that, with a couple of 10- and 20-pound purchases from a beekeeper I'd met who'd become a friend and a teacher, or, even before that, when I moved from a city to simply a place and ... well, how many beginnings can one story have? How many stories am I telling? Today, just this one: from 500 lbs. 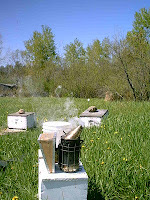 of beeswax to Northern Michigan Beeswax to Pea Pickle Farm. All the same business started about three years ago. Yes, it's an ongoing identity crisis that has everything to do with me, the business remains the same, just all these different names, from the whimsical (500 lbs. ...) to the bland (Northern Michigan ...) with both being nothing but factual, as indeed I did start with 500 lbs. 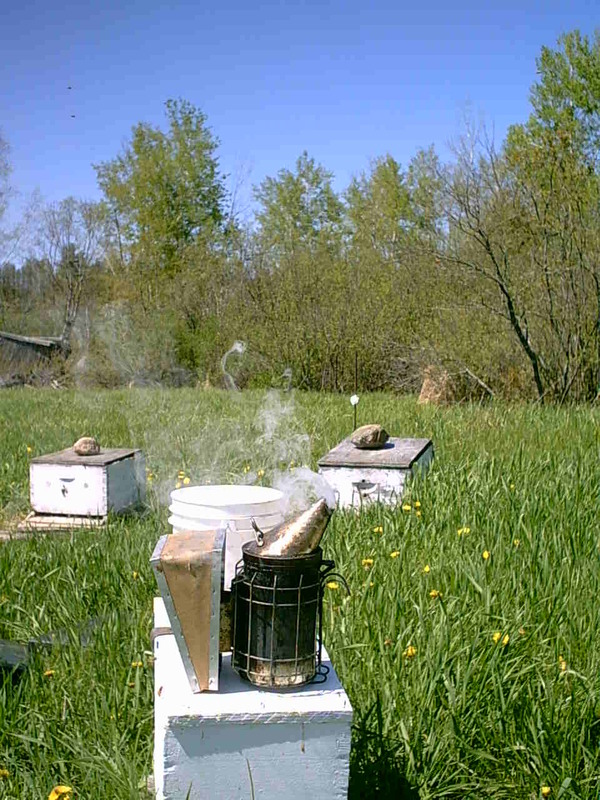 of northern Michigan beeswax and continue with the same, now working on my fourth lot of 500 pounds, so should the business be called 2000 lbs. of beeswax (and whaddaya get, another day older and deeper in debt ...)? Why move away from the facts? Why change the name? Why Pea Pickle Farm? What's that got to do with it? When I started a business making custom jigsaw puzzles in 2003, I was living in Evanston, Illinois. A local Chicago TV reporter sought an interview, saying I fit a story he wanted to do on retirees not retiring, but starting new careers, and this career, this puzzle-making business, sounded interesting. Well. Publicity. Good. Never mind the fact that at age 47 I wasn't retiring nor had even had a career to speak of, just one job after another, none making me rich or securing my old age from dotage and destitution, all of which I told this reporter, and he said, sure, sure, fine, or something like that, and of course the piece, which quickly hit the 6 o'clock news, was all about retirees not sitting around twiddling their thumbs but doing fun stuff like starting puzzle businesses. In the segment I say something about making this change in my life, about starting a business and quitting a full-time job and moving to the Upper Peninsula of Michigan, and about how it's not a "midlife crisis," but a "midlife adventure." Well. Not even my husband, now my ex-husband, bought that line. Yet here I am trying to sell myself and others, once again, a similar line: It's not an "identity crisis," it's "identity development." 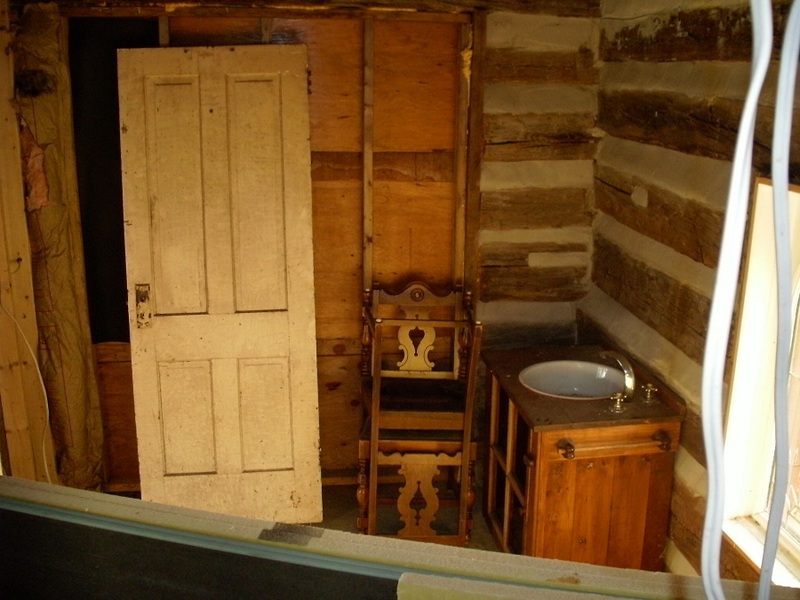 The Palace Bathroom, circa early 2011. I don't know how these things work, but soon I was setting up a shop on Etsy - something I've been meaning to do the past two and a half years - and the process made me realize that if I do this, I better get on Twitter and Facebook, Twitter first, as I tried Facebook once and it freaked me out. Well, no one told me that Twitter is fun, at least not so's I could hear it, and Pea Pickle Farm could have got waylaid right there, I was having so much fun, but for the fact that one can find (or at least this one did) inspiring people on Twitter who make you believe that, uh, it's OK to do what you want to do and moreover, you better get to it. At the moment, I only have two followers, one a loyal friend to my writing and one a complete stranger who I have so enjoyed following that I am honored that she follows me in return, even though I know I am not even a face in the crowd. I am used to writing for no one but myself, so this lack of followers does not bother me. Certainly, I hope my followers grow, as I am beginning to understand that Twitter is very much like old-fashioned word-of-mouth advertising, the best and cheapest way to promote anything, and make no mistake about it, I am trying to sell candles here and earn a living! But I also know, am learning, another thing, and it is trite, so somewhat embarrassing, but: I gotta be me! So that's what Pea Pickle Farm is. It's me. In development. Welcome.